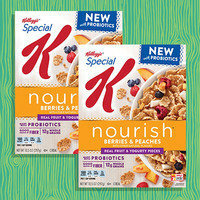 This new cereal features yummy yogurty pieces packed with live and active probiotic cultures! It also has peach-flavored flakes and real dried berries. Bonus: It's one of the few ways you can get your probiotic food fix without refrigeration. Look for it in the cereal aisle! Not all veggie-based chips are nutritious and delicious, but these hearty air-crisped snacks check both boxes. Made with non-GMO veggies, herbs, seeds, and spices, the organic chips are surprisingly satisfying and crammed with cheesy flavor. 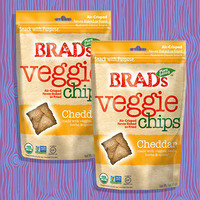 Plus, the entire 3-serving bag has just 150 calories! Check out the other varieties too. Then click to find, or buy online! Need an excuse to eat chocolate? 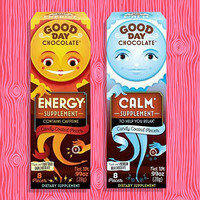 You'll appreciate these chocolate treats and their supplement powers! Choose from Energy, Calm, Sleep, Probiotic, Vitamin D3, and Turmeric. A light candy exterior prevents on-the-go melting, and the rich cocoa taste is top notch! So skip the M&Ms, and grab a pack that suits your needs. Click to locate, or grab a sweet sampler pack on Amazon. Let the benefits commence! We Want to Know MORE About You... and Give You Free Stuff! When it comes to the content we create, we want it to be perfect for YOU, the Hungry Girl readers. And you can help make it even better by taking our short Hungry Girl Fans 101 Survey! We’d like to know if you have kids, if you're a pet owner, where you live... You get the picture. This information is incredibly helpful, and we'd REALLY appreciate it if you could take the survey. January 15th (today) is National Strawberry Ice Cream Day! Let's keep it classic with Edy's/Dreyer's Strawberry Simple Recipes Slow Churned. Supersize a 100-calorie scoop by serving it over a bowl of sliced strawberries! Share the goods! Click “Send to a Friend” now!